On Monday the 16th a couple of us went to see Louise Erdrich give a reading from her new novel, LaRose, out now in hardcover from HarperCollins. This novel is set in Ojibwe territory in North Dakota and draws inspiration from a story Erdrich’s mother told her about a family who shared their son with the parents of a child they’d accidentally killed. LaRose, the young boy who is given to the wronged family in Erdrich’s novel, is the fifth of his name, the favorite child of his father, Landreaux. He’s a spiritual boy who communes with his ancestors and has a strong relationship with the young girl Maggie, who thinks he’s a saint. When we saw her, Erdrich read two passages about Maggie, one a harrowing passage of violence narrowly escaped, the other a tense yet hilarious account of a volleyball game Maggie’s team wins. After the reading, the audience had the opportunity to ask questions about where Erdrich draws inspiration for her novels (from her rich heritage and her ancestors), how she feels about the education system on reservations (we need to celebrate Native American teachers and build more immersion schools where children can learn traditional Native American languages), and what books she would recommend (works by Tracy K. Smith, Marlon James, and Ocean Vuong, among others). Win a Signed Copy of Love Medicine! We were lucky enough to meet Erdrich briefly and get a signed copy of one of her most popular books, Love Medicine. 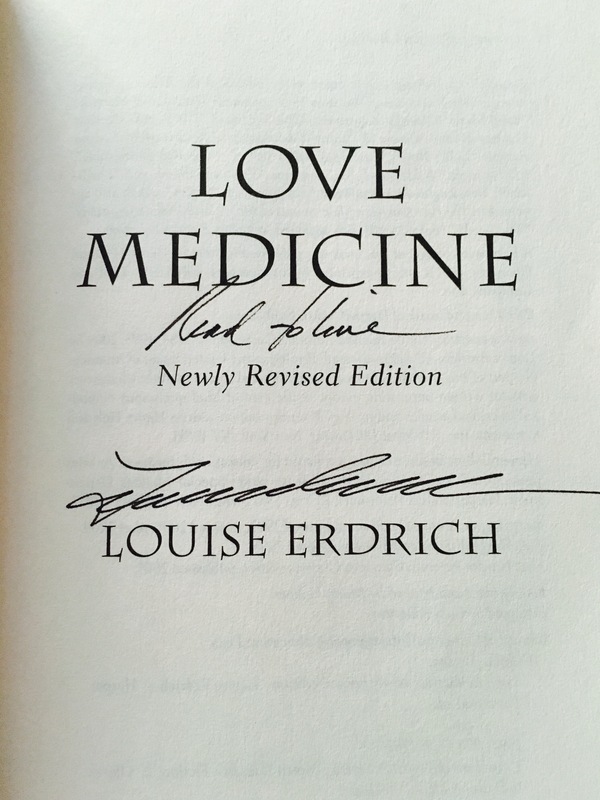 Since this book is often taught in high school, we thought we would give a student a chance to win this autographed copy of Love Medicine, which includes a personalized message from Erdrich herself: “Read to love.” It’s good advice for readers of any age. Check out the inscription below, and let us know in the comments, on Twitter, Facebook, or Instagram if you want this special copy. We’ll pick one lucky eNoter at random. Many thanks to Town Hall Seattle and Elliott Bay for sponsoring the event and letting us attend!